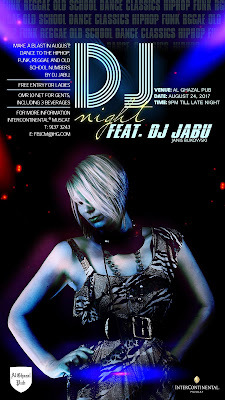 This weekend at the Al Ghazal Pub in the InterContinental hotel DJ Jabu will be delivering aural delights from 9pm till "late night". Ladies enter free, and for gents its a tenner - but the good news is that you get 3 drinks with your entry charge. If you'd like to know more, you can call on 9137 3243 or email on fb.icm@ihg.com.